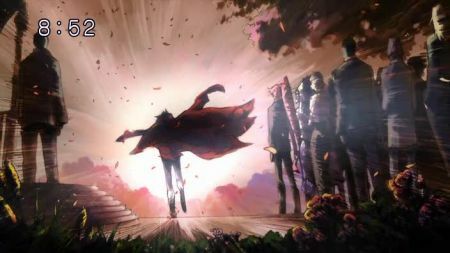 So it’s finally the end of Gurren-Lagann. Not the greatest ending I’ve ever seen, but a suitable one. 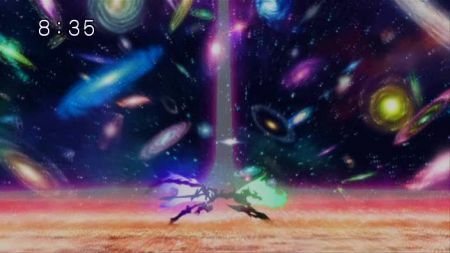 Neither good or bad, and definately not the Gainax mindf**k. The final galaxy-spanning battle truly was awesome; a lot of the yelling helped. 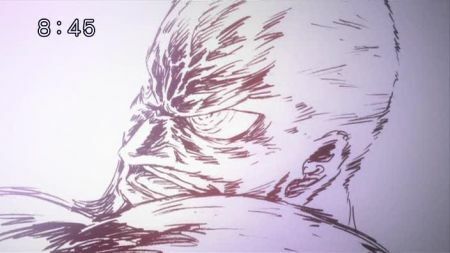 Lord Genome’s manly death and sacrifice was the best part, coming full circle from first half villian to second half hero. The anti-spirals got fleshed out a bit more,too. Went from being a grand dimensional government to a species with extreme self-esteem issues. The formless bodies were a nice touch, though. I was actually surprised by Nia’s death. After all that Simon STILL can’t have her. The way it was handled made it hard for me to feel sad. If Simon’s happy then I won’t really worry about things. Finally there was the “life goes on” epilogue. One thing I learned from the ending is Gainax can’t draw older men. God is Rossiu ugly. Leeron stays fabulous of course. Yoko is old lady man and Viral is still GARMOE. And then there was Hobolock-I mean Simon. It really is fitting he chose to wonder the world, though you wonder what he did all that time, and where the drill spear came from. The only really disappointing things are no real Garlock, no grand dimensional government, no “all the stars are enemies,” and no final battle against God aka. The Will. Is there room for a sequel? Definately. Will we get one? Knowing Gainax, keep an eye out for End of Gurren Lagann for spring ‘08, hopefully where the previously mentioned things will be shown. Gurren-Lagann has definately been one of the best mecha shows in many years, probably since Gaogaigar FINAL. It’s a culmination of the super robot revival that’s been going on for the whole decade. Was is good? Most of the time, yes. It gave us great characters, probably the most gar man ever in Kamina, great battles, and an epic plot that spanned the universe. Sadly, the plot kind of fell apart after the time-skip and never quite recovered the earlier pace till the later episodes. I don’t think we really needed all the episodes to show Simon being in prison or the Chouginga Gurren-Lagann trying to transform. The deaths in the latter half also felt a bit arbitrary, with only Kittan’s and Genome’s really getting the emotions going. So I would have to say episodes 7-15 were really the best. I definately know I’m going to miss those thousand posts stickies on /m/ now. Oh well, it was fun Gurren-Lagann. Now I just need that damn soundtrack. ROW ROW FIGHT DA POWAH! DESPAIR GOES TO THOSE WITH COURAGE!